Student Nonviolent Coordinating Committee organized and performed at open mic to raise money towards child education in Nepal. | Photo by James McIntosh. 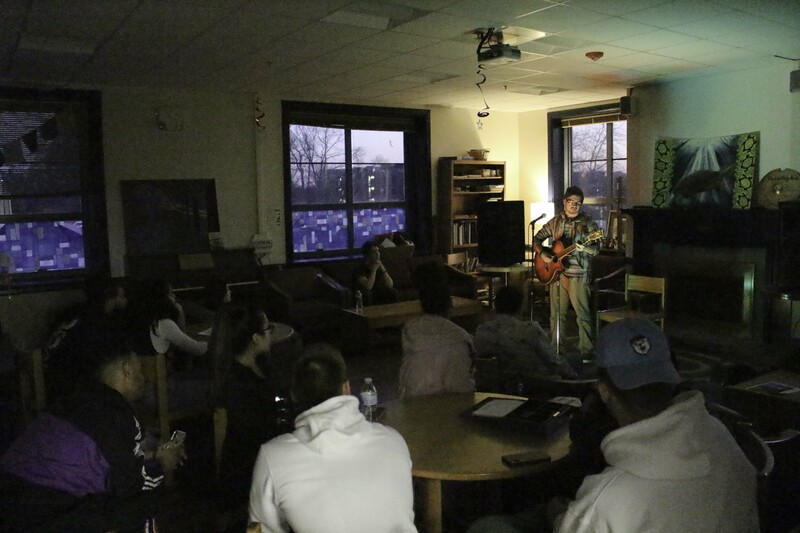 The University of Rhode Island’s Student Nonviolent Coordinating Committee (SNCC), hosted their first open mic night on April 3 as a fundraiser for children’s education in Nepal. This was a free event open for donations and was held at the 193 Degrees Coffee house at the Memorial Union. Malave stated that taking up non violence and peace studies as a minor helped her make better personal life changes. This personal growth and change inspired her and the other members of the SNCC to do some powerful things on campus and spread the message of nonviolence. 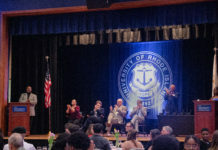 Paul Bueno de Mesquita, director of the Center of Nonviolent and Peace Studies, opened a non violent and peace center in Nepal that is directly connected with the one at URI. He came up with this idea of collecting donations and fundraising to help the students there who were affected by the earthquake that caused mass destruction in Nepal, in 2015. So far, the SNCC has raised almost over $150 dollars. This money can send almost three children to school in Nepal. This event hosted wide ranging performances such as playing guitars, singing, an interactive free style rapping session, Autonomous sensory meridian response (ASMR) performances of eating pickles and stand up comedy. Similar donation and fundraising events have been hosted in the past by other SNCCs around the world. The Student Nonviolent Coordinating Committee started last year to spread the message of incorporating nonviolent methods to address conflicts in life and practice mindfulness.The club was recognized by the student senate this semester. Since then, the club members have been looking for new ways to promote their activities on campus. The SNCC is also planning to leave the donation open at all times. Anyone who wishes to donate can contact Jocelyn Malave at jocelyn_malave@my.uri.edu or message @sncc_uri on Instagram. The club meets every Wednesday from 5-6 p.m. at the Harge forum in the Multicultural Center.